Petra . . . is situated on a spot which is surrounded and fortified by a smooth and level rock, which externally is abrupt and precipitous, but within there are abundant springs of water both for domestic purposes and for watering gardens. Natural springs provided a reliable source of water in an environment where the annual rainfall is less than 10 centimeters. However, a populous center such as Petra could not rely solely on the local springs, and so Nabataean engineers designed a complex hydraulic system that captured and stored rainwater for use through the long arid summer months. 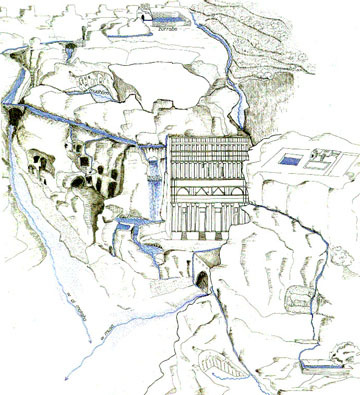 Schematic reconstruction of Petra's hydraulic system. from Laureano, P. Abitare il deserto: il giardino come oasi. Giardino Islamico: Architettora, Natura, Paesaggio, A. Petrucciolo, ed. 1994: 63-84. Electa, Milano.